Father’s Day and baseball go hand in hand. A Sunday in June dedicated to celebrating those who taught us how to catch, hold a bat and so much more. Baseball is the only major professional sport being played in June. A day at the ballpark is the perfect setting to celebrate your dad. Over twenty years ago my dad passed away. He has been absent most of my adult life. I miss him and unfortunately he’s not always in my thoughts. Writing this blog made me think of things about him that I had not thought about in years. He loved sports especially baseball. 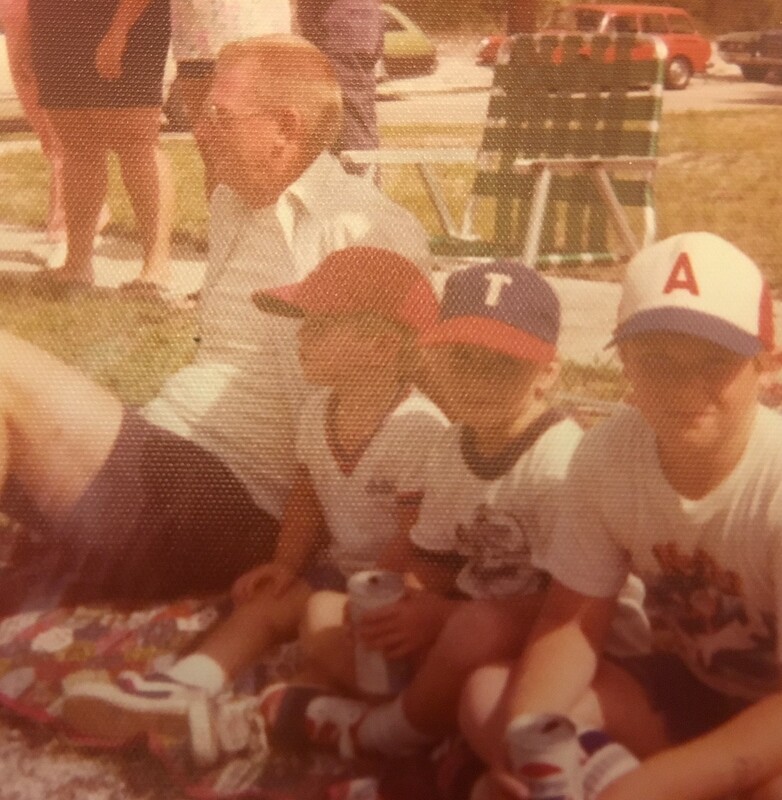 My brothers and I were raised around the game of baseball with our dad as our teacher. My dad put me to work on a ball field as soon as I was walking. I was picking up bats for his Little League team the Lions at 2 years old and dragging them back to the dugout. My official title was “Bat Girl.” My dad coached Little League teams for 20+ years coaching so many kids it was rare for us not to run into his former players where ever we were. Looking back at my childhood I feel incredibly lucky being able to grow up at the Fee Avenue fields. The fields were our home away from home. They allowed us something other than our yard to explore and gave us space to run and move. The park itself was just okay. They were the type of city fields where the infield was full of bad hop rocks and the outfield filled with ankle spraining holes. The stands were wooden benches complete with green peeling paint. We spent 3 to 4 days a week at the Fee Avenue fields forging friendships with kids that didn’t go to our schools and we never would have met otherwise. Since my dad was the coach we always picked up and dropped off several kids for practices and games. These kids came from broken homes with parents that we never saw. They lived in rougher sections of town and most never had their mom or dad come watch them play. We always picked them up even though they didn’t live on our route to the fields. This was an act of kindness that truly made me appreciate my dad. He never asked their folks for gas money or complained about having to stop to get them. He must have known without us giving them a ride they wouldn’t have the opportunity to play baseball. Without us they wouldn’t get to play on a field with a team and have some sort of normalcy in their lives. These kids would always be outside on their doorstep ready and waiting for us ready to go. They would run and jump in our car and off we’d go to afternoon practice or to a night game. You could see it on their faces. They were so happy when we’d pull up. My dad never letting them down never disappointing. Other adults let them down but we always showed up and always welcomed them into our car filled with kids and free wise cracks. For some of those kids we played the roles of brother or sister. We were instant siblings and actual playmates to them. Thank you dad for being so giving with your time and giving those kids an opportunity. You treated them all just like us like they were one of your own. Three kids already to manage and wrangle a few more didn’t matter to you. Without you they would never have been able to play baseball or get to experience Little League. I’m not sure if you were ever thanked so I say thank you. My brothers and I noticed your generosity. We noticed how unselfish you were and how giving you were to those less fortunate. You were a great teacher on many levels. Happy Father’s Day dad! Becky: That was a great column about your dad. I share a few of those memories from when we would visit Florida occasionally in the summers. Your dad was always coaching and taking kids to and fro. I always enjoyed seeing him, especially on the field. He even came to my last Dixie Youth League state tournament in Virginia in 1973 and saw me belt a few homers!